Another room that needs serious attention is one we call “The Cat Room”. Even though there is furniture and a very nice king sized bed (actually two stacked on top of each other) there is no way we can consider it a guest room. 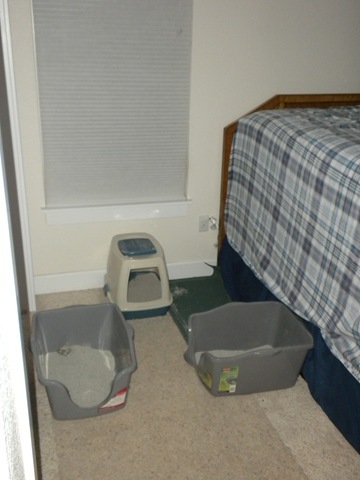 Who would want to stay in the same room with a bunch of cat litter boxes? Aside from the shelf in the corner there, the closet is also full of stuff from the basement as well as every drawer in the dresser. We even have hidden boxes behind the bed. 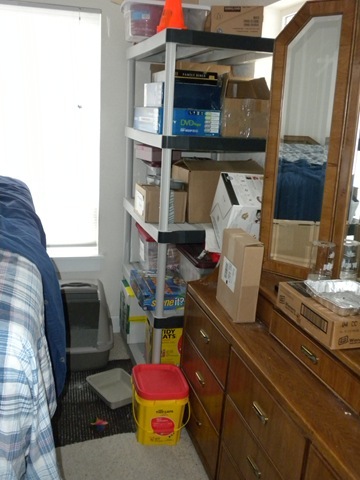 Of course we would prefer not to have an entire room dedicated to cat litter and storage. There must be a better way. January 22, 2010 · Filed under 2. Get organized.